Join us in celebrating! Send in your favorite blast from the past photos. Be sure to include names and dates of the pilots, helpers, and vintage of the model. On a summer day in 1991 Bob Violett is introducing Rob Lynch to the inner workings of a JPX T-240 propane powered turbine Bandit. The background reflects the jet friendly R.C.A.C.F. Club field. 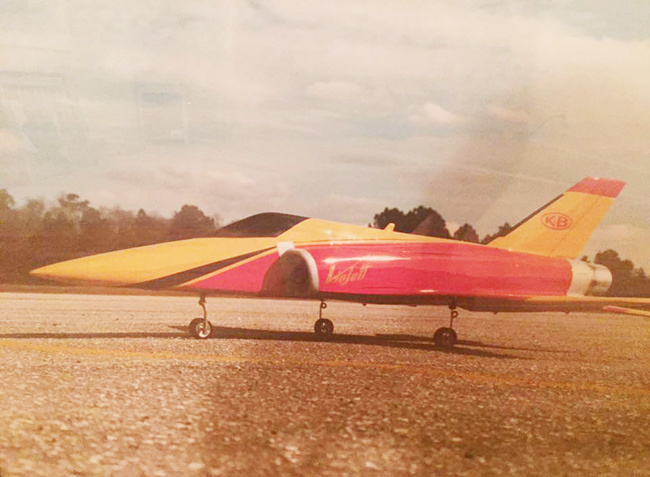 Early 1980's Photo of production prototype (I think kit # 2) ducted fan A-4 built when both Bob and Mike lived in Maryland before he and family moved to Florida. Photo was taken at Prince Georges RC field before the madden flight. I scarred both Bob and myself but the flight was successful Including a near perfect landing. This BVM F-4 was flown at FL Jets 2001 and it is still operating with an AMT Pegasus. 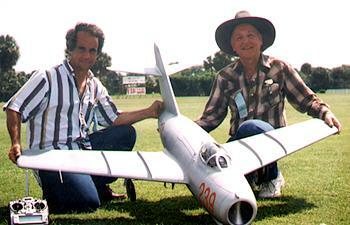 Roger Shipley, friend, and F-4 owner David Gladwin presented it. November 22, 2003. Triple Tree had just opened, Tommy Dodgson was kind enough to do an install on a brand-spanking new KingCat, and we were out burning jet fuel. The model is still with me, 14 years later. It suffered a couple of tough landings, but great engineering saved my bacon. And now, with upgraded servos, radio, engine, canopy, and stabilization it’s markedly better than the day it was new. My Dad always said “buy cheap, buy twice.” Wish more modelers understood that one! Not that I calculate these things, but if I did, my cost-per-flight on this model would be very low. 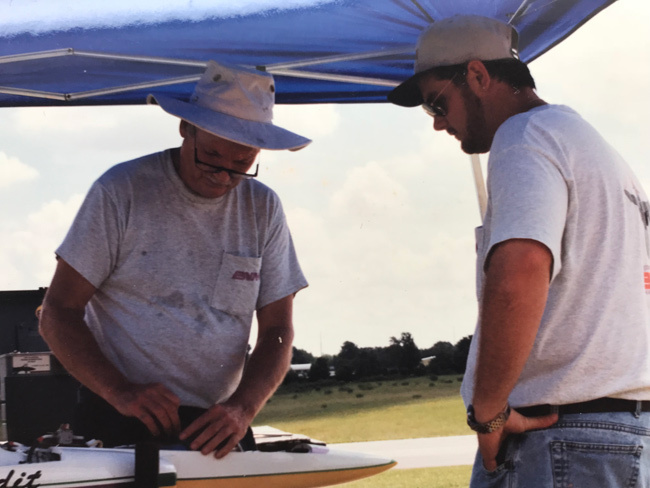 Since the day we met at PGRC in the early 70’s, when you first came up with the Scozzi-powered F-4, you’ve been an innovator and a great friend to many - always gracious with your most valuable asset: your time and knowledge. You taught me how to build, paint and fly. What a lucky guy! I shudder to think what modeling would be like had you been interested in cars instead of airplanes. Thanks for all the great memories. 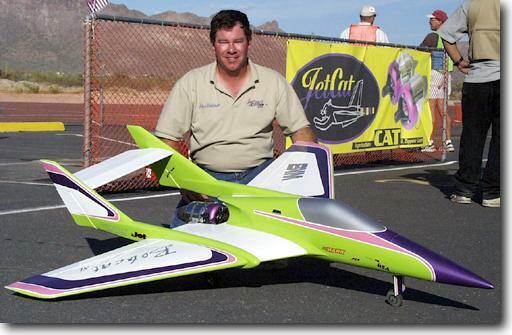 Dawn and Steven Ellzey enjoyed their custom painted KingCat from 2004. 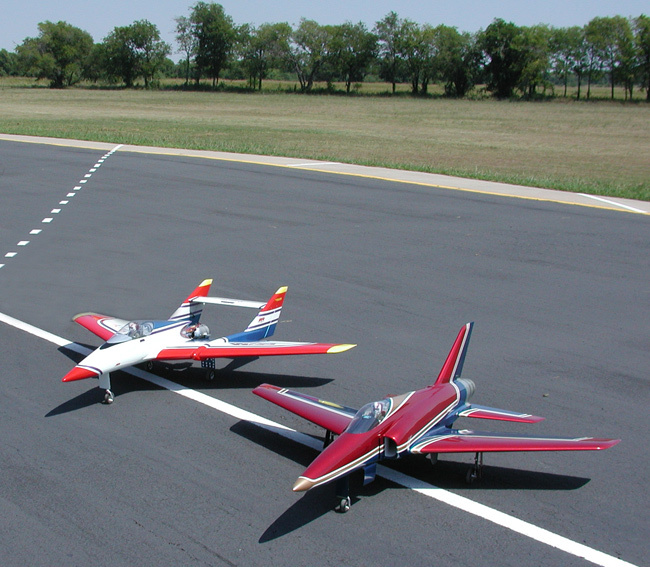 The Ellzey's also built, painted, and flew these early BobCat and Bandit. 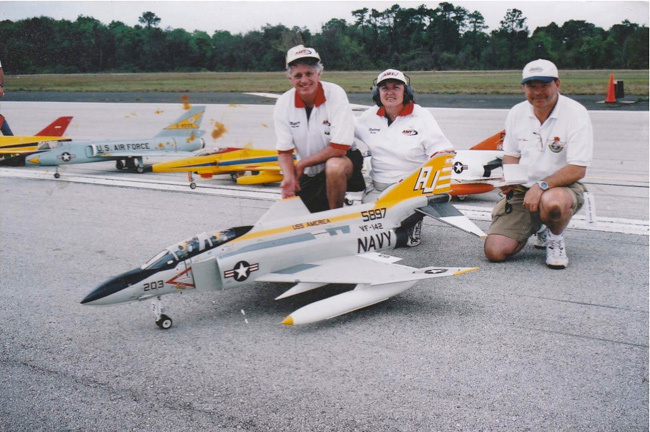 BVM's General Manager, Patty Generali poses with the Blue Angel F-4 at the Jets Over Deland event in 2000. 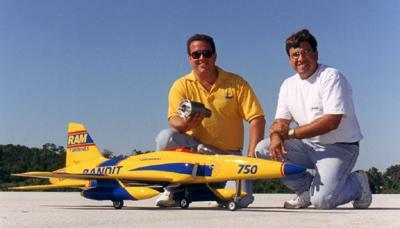 Vern and Larry Kramer showed this AMT Mercury powered Bandit at the Jets Over Deland event in 2000. Vern's craftsmanship and Larry's piloting skills are exemplary. 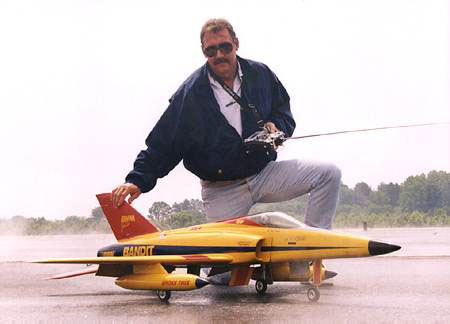 Craig at the Mid Atlantic Jet Rally in 1998 after an early morning flight with the Bandit. Here is to magic moments! A testament that BVM models are built to last! 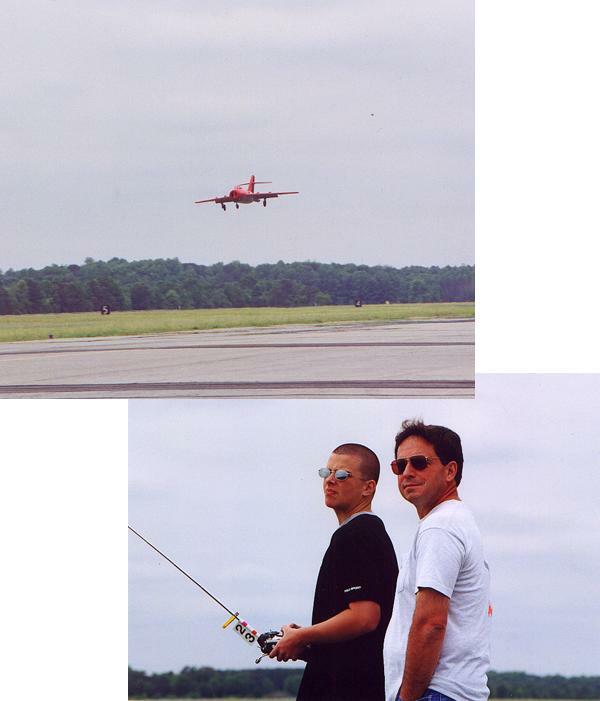 Attached you will see my BVM small Bobcat with a RAM 500 and my son Ricardo at Superman Jet rally back in 2001.Today he is an Aerospace Engineer, commencing his engineering career with TEXTRON. Couple weeks back I decided to update the Bobcat to 2.4 and fly it again. Yesterday was the perfect day and it flew just like it did in 2001, fifteen years later and still rocking! Awesome! P.S. 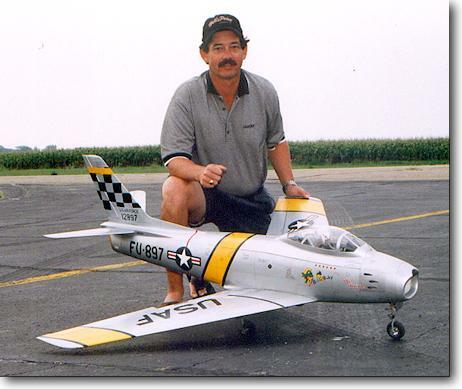 This is a photo from TG 2008 flying the F-80 with RAM power. Edgar Perez was my caller then, and now he is a proud BVM customer. 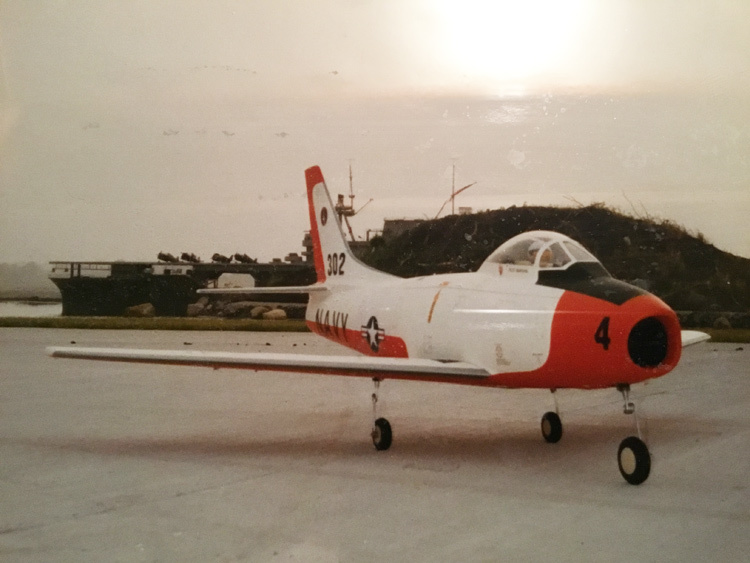 Marshal Emmendorfer's F-86 is on the runway at Byrons, circa 1990-1991. This picture of Marshal Emmendorfer's Viper (built by Jerry Worth) is also at Byrons only a couple years earlier. 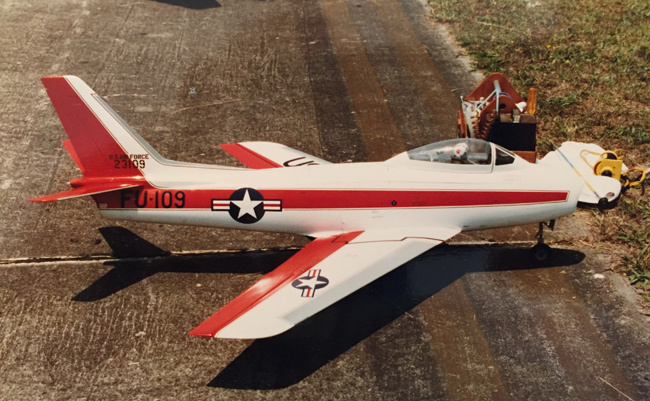 A sport jet in the Blue Angel scheme has always been Bill Harris's signature and this Bandit "T" complete with panels and rivets and a buffed clear coat has to be his best. 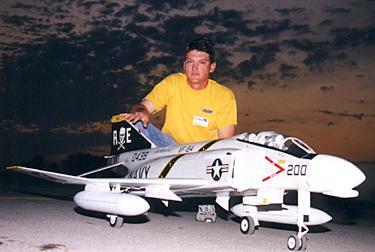 Photo was taken at Florida Jets in 1998. 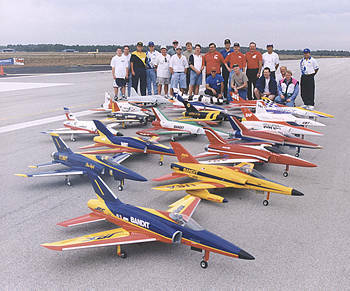 Eighteen Bandits and there happy pilots were at Florida Jets 1998 event proving that the Bandit is fast becoming the sport jet of choice. Just ask any of these pilots what they think of their all composite kit and how it flies -- BVM's best advertisers. These Bandits were powered by a selection of VIOFANS and BVM .91 and .96's, the RAM 750, the AMT Mercury engines and the JPX T260's. This BVM Phantom was powered by a single AMT Pegasus turbine and it performed flawlessly with Terry Nitsch at the controls. 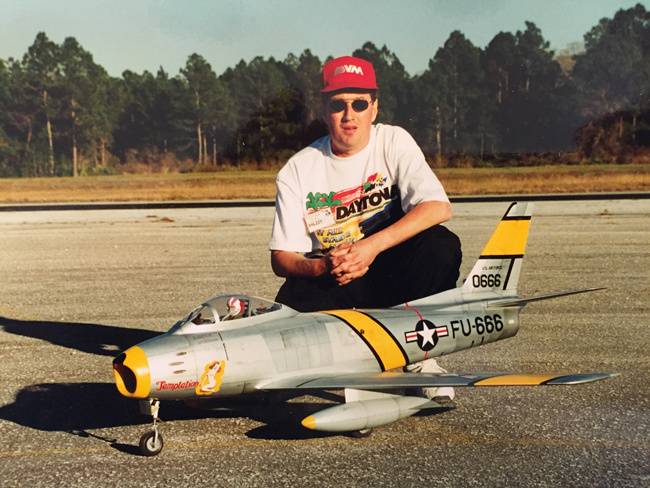 Photo was taken at Florida Jets in 1998. 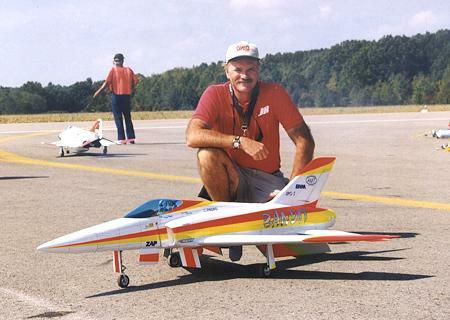 BVM rep Rob Lynch is a very very good aerobatic pilot and he kept his Bandit "V" in the air constantly at the Florida International Jet Rally in 1998. It utilizes the VIOFAN/BVM .96 power package to perform convincing vertical maneuvers. Rob's crosswind landings were always on the centerline - good technique with a good design. 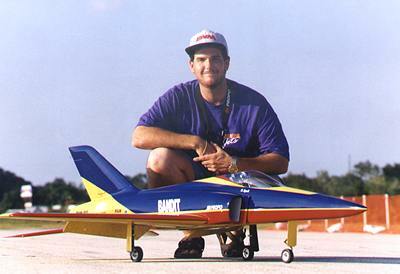 Albert Araujo and Rei Gonzales of R.A. Microjets attended Florida Jets International event in 1999 to fly their newly painted Bandit. Bandits and P-80's were popular at Best in the West event in 1999. 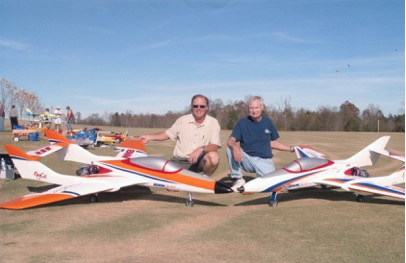 Here, event organizers Kent Nogy and Dan Johnson, show off there beautifully crafted models. 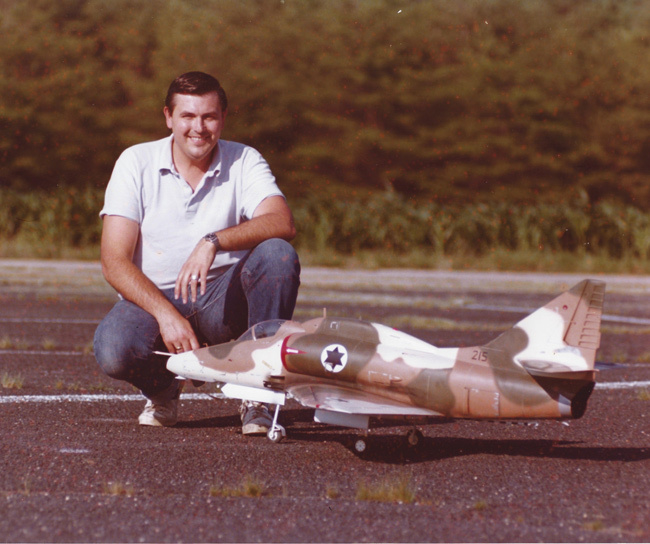 Besides being a great pilot, Tim Redelman is also a great modeler as you can see. This Bandit has over 200 flights, first with JPX power and now with the RAM 750. This is from the Jets Over The Heartland event in 1999. 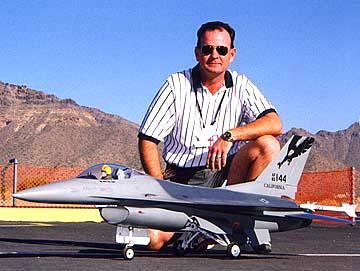 Mark Taylor from Arizon Jet Rally in 1999, duplicated the F-16 he used to fly in the Air National Guard. It is powered by a VIOFAN and BVM .91. 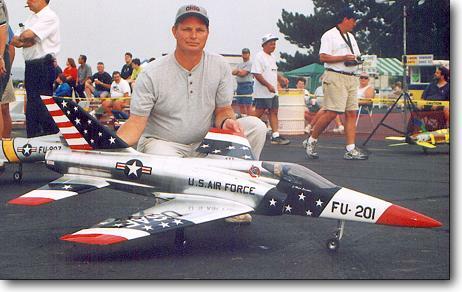 Tommy Wood at Superman event in 1999 flew his F-4 at least a dozen times during the 3 day event. This photo taken just after a late evening landing. In Naval Air, we called these "pinkies" that's a night landing the easy way. Francis Pischner is rightfully proud of his Bandit with the Bandito and spider tail art. 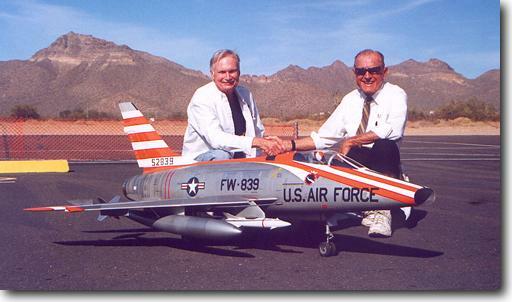 It was built & finished by Vern and Larry Kramer and flown 26 times at the Superman event in 2000 with flawless operation from its AMT AT-180 (Mercury) powerplant. 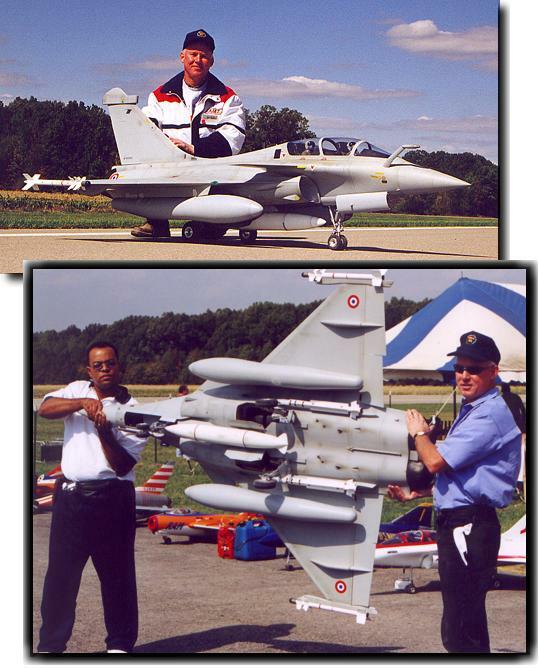 Joe Grice is rightfully proud of his Rafale B-O1. This all grey scheme is the latest to be applied to the French fighter. Joe opted to make the aircraft look like it had been used for awhile with some very effective techniques. Robert Clark assists Joe to give us a glimpse of the Rafale's underside. The inboard missiles are called MICA's (Joe's creation) the outboard missiles are termed MAGIC's and are of BVM manufacture. The centerline tank and its pylon are from Joe's research. This is from the Superman event in 2000. Here you see representatives of the two senior groups. Bob Violett is honored to enjoy the friendship of a true American hero, Col. Bob Thacker. 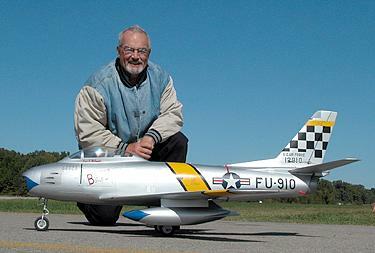 The Colonel flew a lot of different airplanes for the USAF including the F-100 Super Sabre. This photo is from Arizona Jet Rally in 2001. 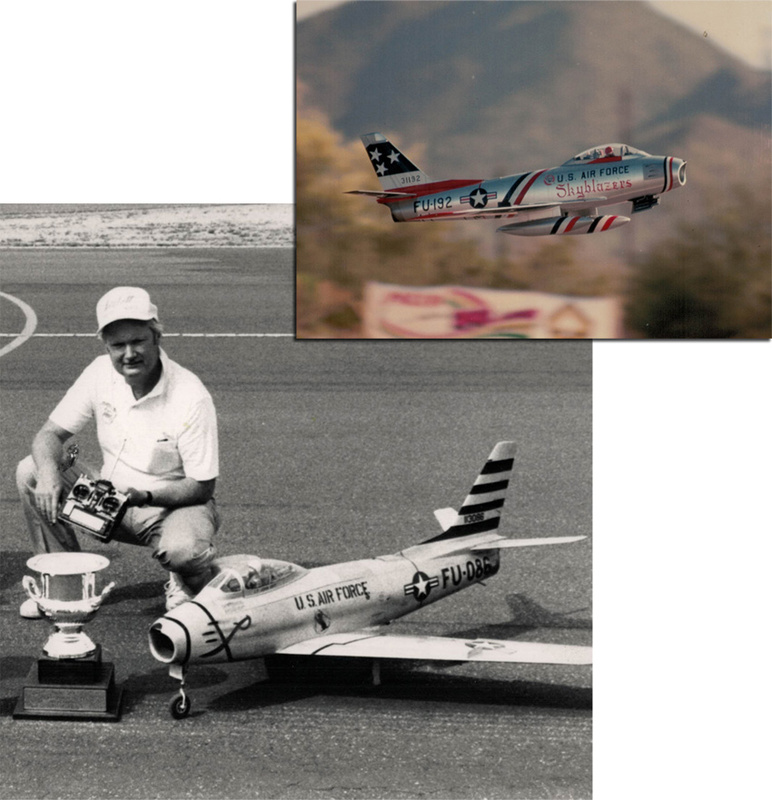 A JetCat P-120 and a BobCat XL make a great combination as John Redman proved with many flights on his in the Arizona Jet Rally in 2001. We get many letters of compliment from modelers who John has helped get a good start in jets. 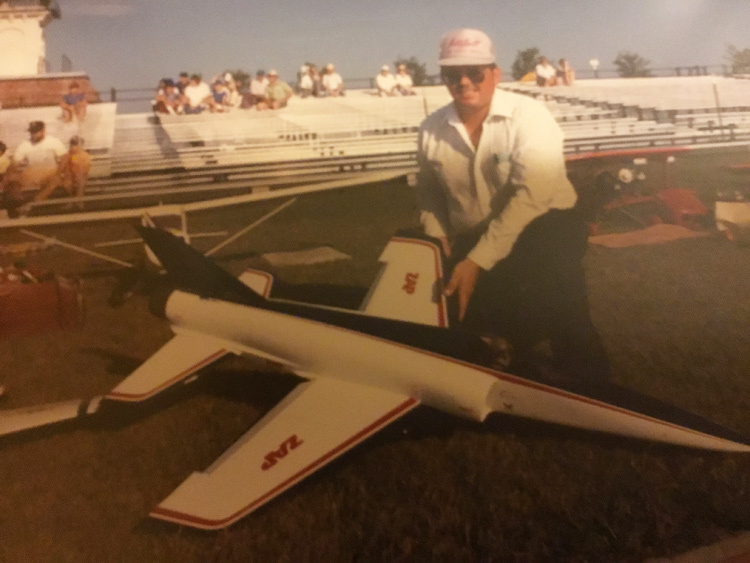 Joe Rafalowski attended the Heart of Ohio Jet Scramble in 2001 and showed off his brilliant RAM 750 powered Bandit. The Coverite Presto enhanced airshow scheme was very impressive in the sunny sky. 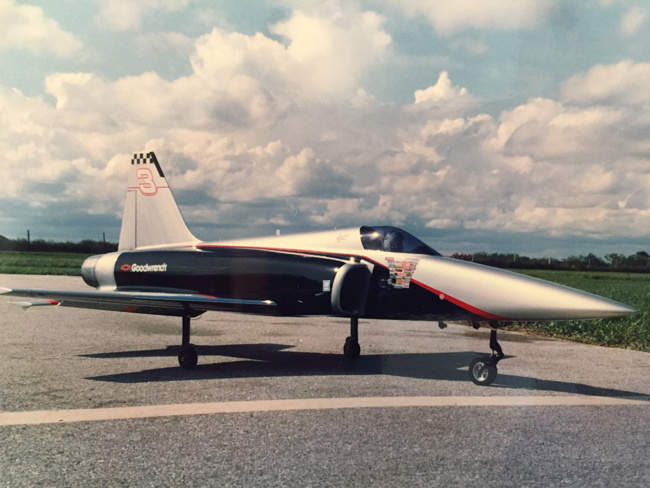 The color scheme is borrowed from a Skyblazer F-100C, circa 1960 - a good match to a Bandit planform. 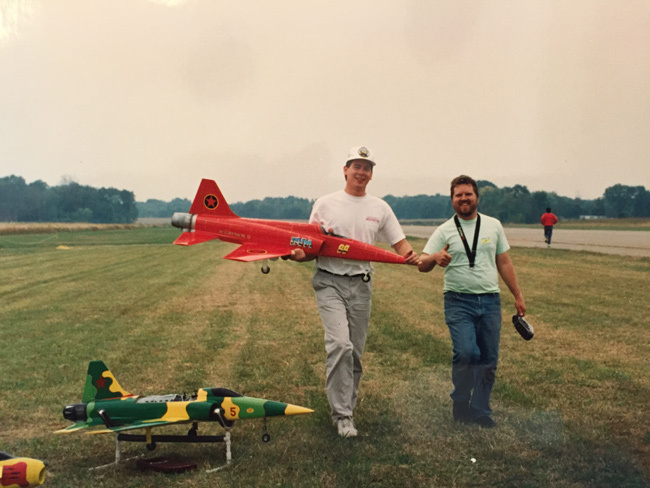 Gordon Dickens attended the Heart of Ohio Jet Scramble in 2001 with his Jet-Cat P-80 powered BVM F-86F. This particular airframe was built by Sam Leonard and features the extended - 40 wing. 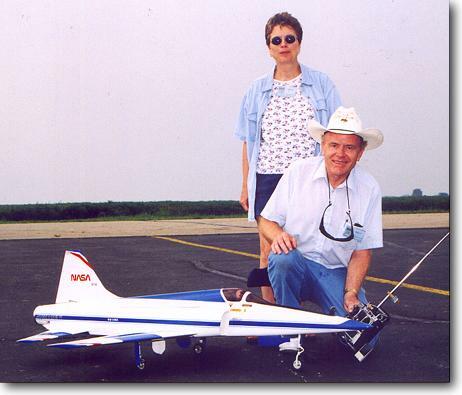 Pam and Dave Bloomer attended many of the mid USA events. This photo is from Heart of Ohio Jet Scramble in 2001. Dave's Aggressor III with BVM .91/Viojett power is a fine example of longevity and reliability of this ducted fan combination - literally hundreds of flights to its credit. 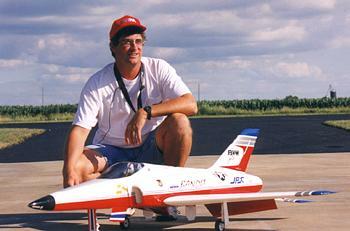 Jerry Caudle with his Sabre at the Superman Jet Week in 2002. The BVM Phantoms wearing the VF-161 scheme are the products of Ad Clark from Kalispell, Montana and Matt Carrol from Oak Park, California. 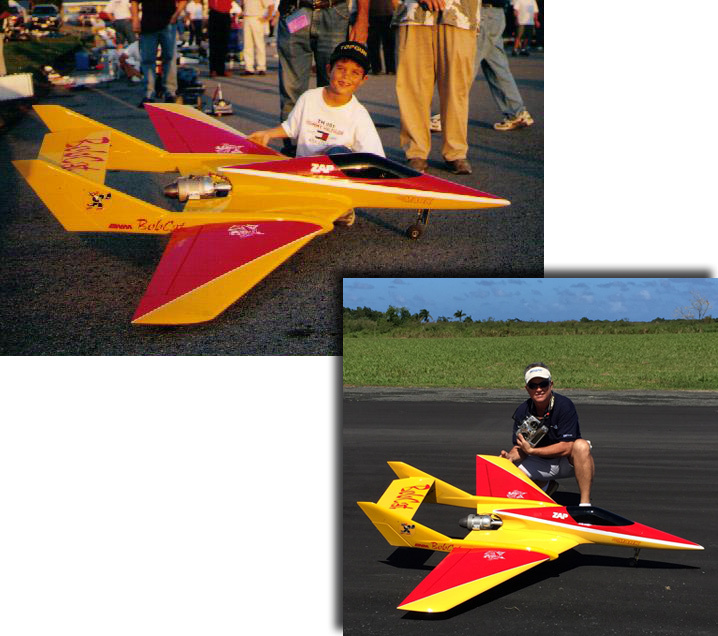 Ad's was powered by an AMT Pegasus SP while Matt's sported one of the JetCat P-160s. Both jets have very impressive performance. The Vulcan gun pod on Ad's F-4 center pylon was complete with sound and visual effects. 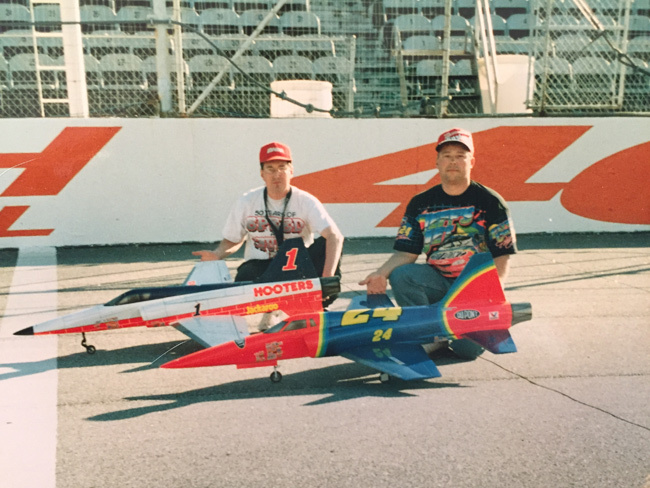 This photo is from the Superman Jet Week in 2002. Jack's smile starkly contrasts the ominous rolling thunder cloud approaching the field from the west. 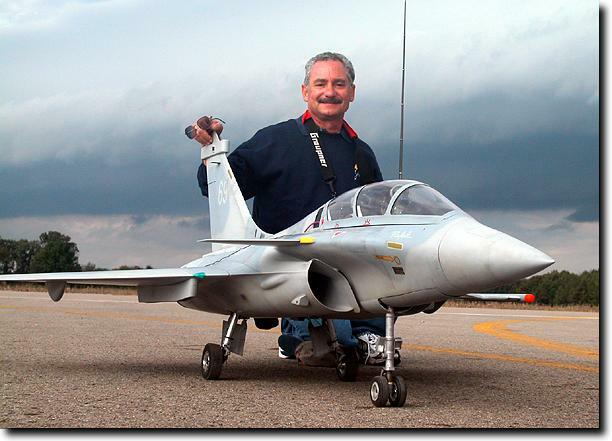 We think that his smile reflects Jack's pleasure with the performance of his Rafale on twin JetCat P-160 power. 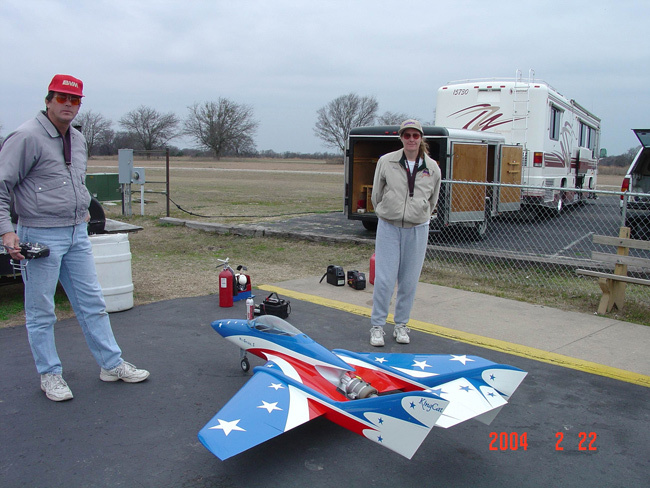 The engines worked flawlessly for dozens of flights during the Superman Jet Week event in 2002. Black airplanes that can handle the sun are tough to accomplish, but they sure can be beautiful. 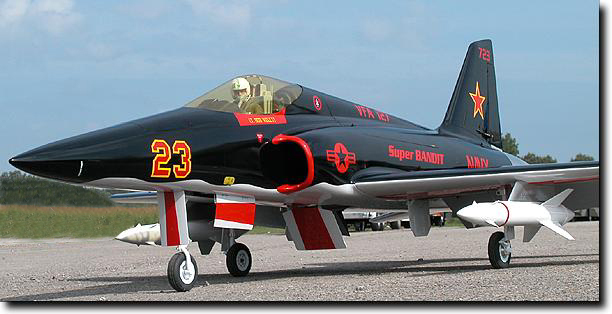 This scheme is borrowed (and modified) from a NAVY Aggressor F-5. Multiple coats of black, multiple sun curing and block sanding between coats. Then sanded and buffed out clear is a demanding, but necessary process. Skin temperature reached 186° F on a 95° F Florida summer day. 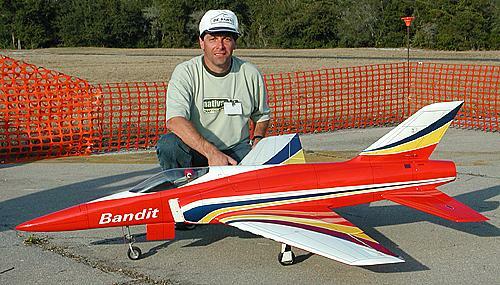 All the way from Brazil, this superbly finished balsa Bandit was built and flown by Celso De Santi during the Jets Over Deland event in 2001. 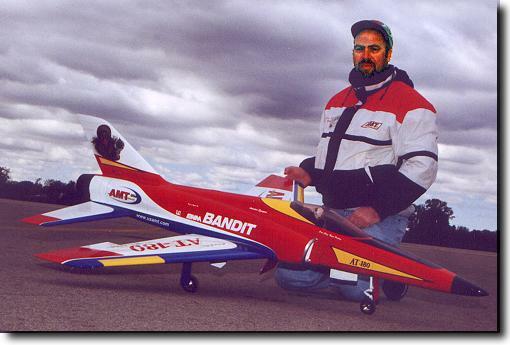 Celso powered his balsa Bandit with a RAM 750+. 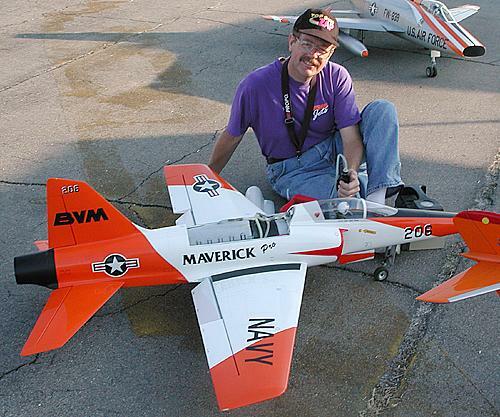 Dave Valdez - your "wing man" at BVM enjoyed the 2nd season on this BVM .91/Viojett powered Maverick Pro. 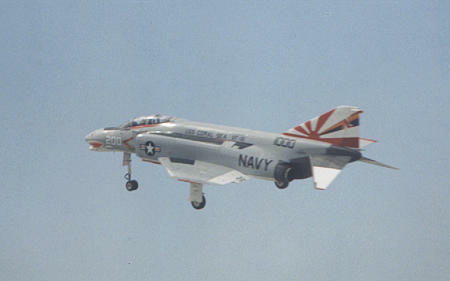 The orange and white scheme was borrowed from a Navy Skyhawk. 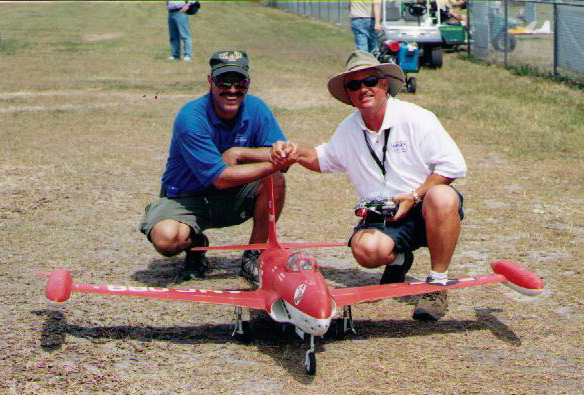 This photo was taken at the Jets Over Deland event in 2001. 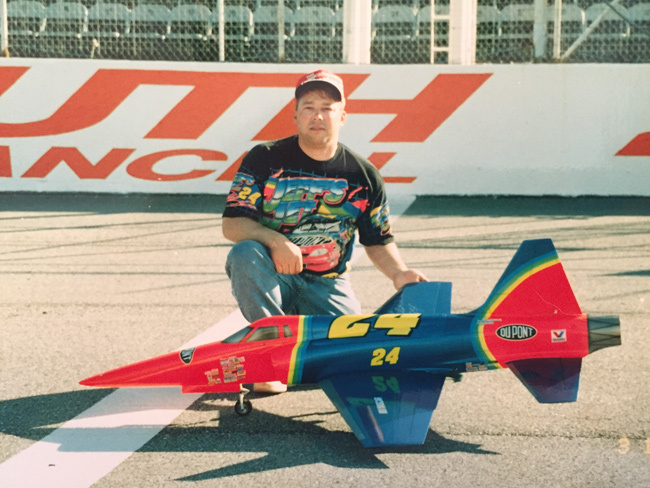 Terry Nitsch at the Superman event in 1998. His Bandit is powered by AMT Mercury. Its brilliant neon paint trim really adds to his display of jet aerobatics. In the background Vernon Montgomery's BVM F-4 awaits take off clearance. 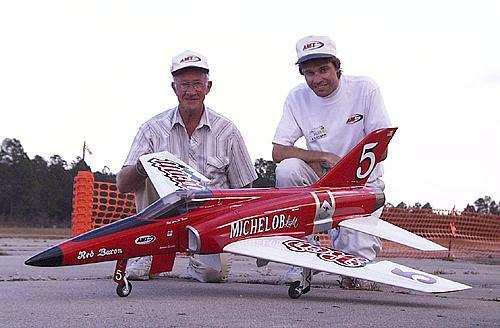 Tom Dodgen and Sam Snyder (both from Texas) teamed up for the first time to campaign Sam's trend setting MiG-15 at the Top Gun event in 1999. The extreme internal detailing of the cockpit, gear bays, gun bays, speed brakes, flaps, and access panels did add some weight but the RAM 750 engine and generous wing area and fat airfoil allowed this 24 pounder to handle the grass field quite well. Rock Solid on the approach, this MiG-15 is being landed by Dave Malchione Jr. while dad approves. Both are great pilots and reps for BVM. 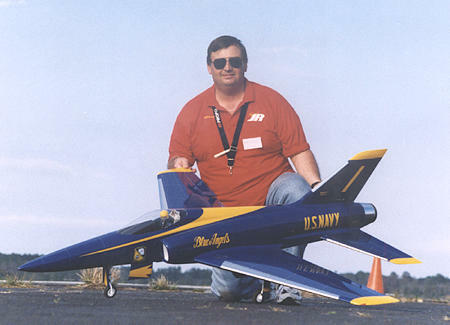 This photo was taken at the Mid-Atlantic Jet Rally in 2000. 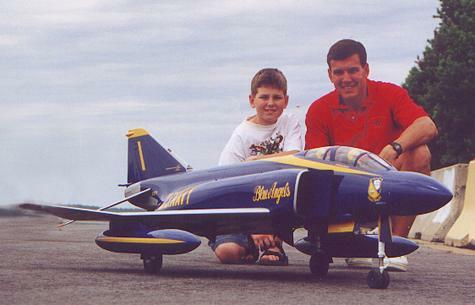 Commanding Officer of VFA-87 (F-18's) Tom Huff enjoyed the Phantom flights with his son Zachary during the Mid-Atlantic Jet Rally in 2000. 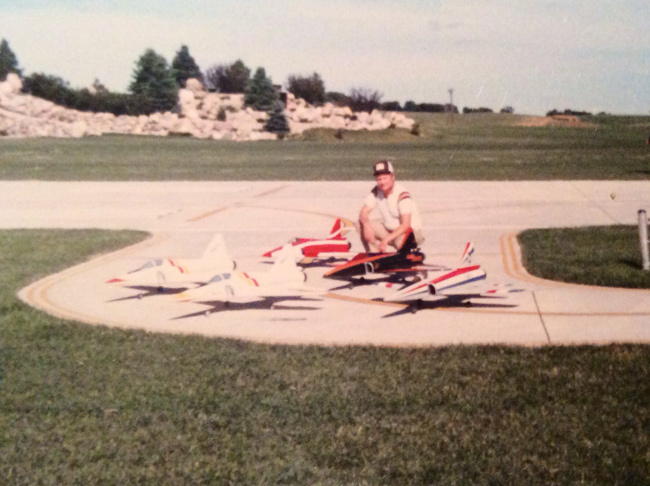 Bob photographed with 5 Sport Sharks at Byron Originals event in Ida Grove, IA in 1986! Courtesy of Gerry Glier. 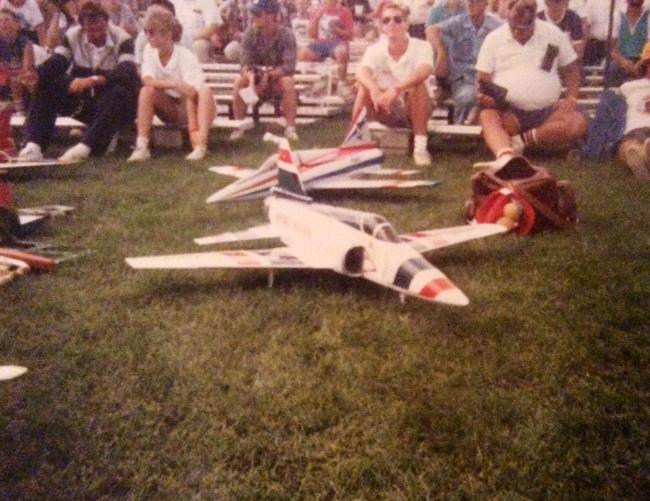 Spork Shark in the ready box at Byron Originals event in Ida Grove, IA in 1986! Courtesy of Gerry Glier. 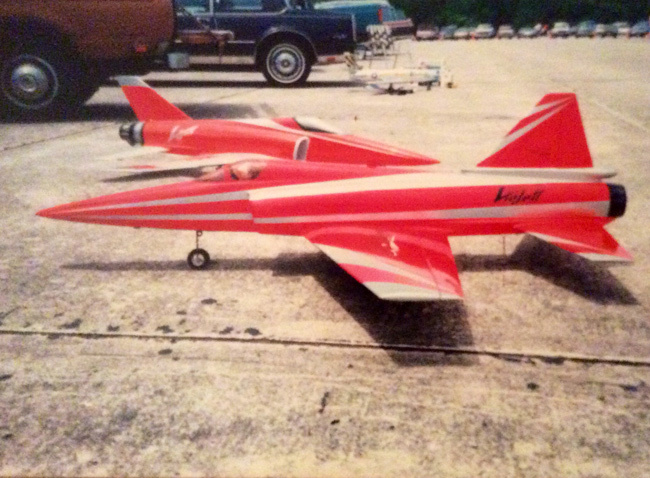 Red/Orange Viper powered by a KBV82 in 1987. Courtesy of Gerry Glier. 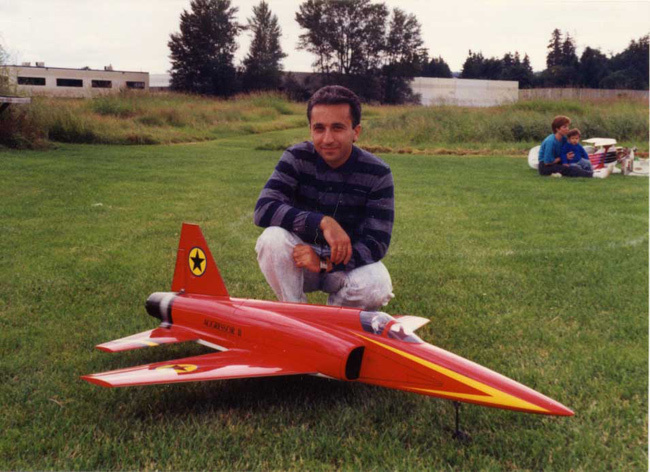 Behzad Pakzad with the Aggressor in 1991 in Redmond, Washington. Seattle "Museum of Flight" First Place F-16 in 1994. Courtesy of Behzad Pakzad. 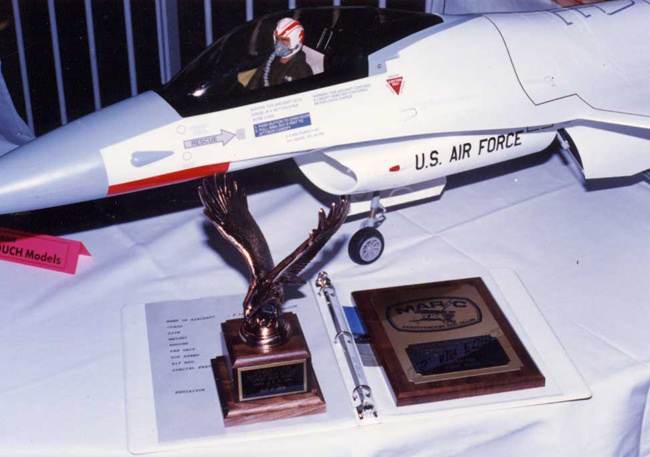 1988 Viper, owned and flown by Daniel Hemming. All graphics, photos, and text Copyright 2017 BVM, Inc.
Use of graphics or photos without written permission from BVM is strictly prohibited.